Anthony Martial will return from injury. Manchester United's training saw Anthony Martial, Ander Hererra, and Nemanja Matic return to the training in order to prepare for the Red Devils clash with London's very own Arsenal. Ander Hererra's injury came as a surprise during Liverpool's clash with the Devils at the Old Trafford, getting substituted out in the first half and missing two matches in the Premier League. Hererra also didn't get to join his team in the second leg of the UEFA Champions League's quarterfinals qualifiers against Paris Saint-Germain. Matic got injured on the 20th of February, missing Liverpool's clash along with Crystal Palace's match, Southampton's amazing showdown, and finally Paris's match. Matic's replacement for Paris's matchup was McTominay, with a record of seven times in the starting lineup for a match this season. 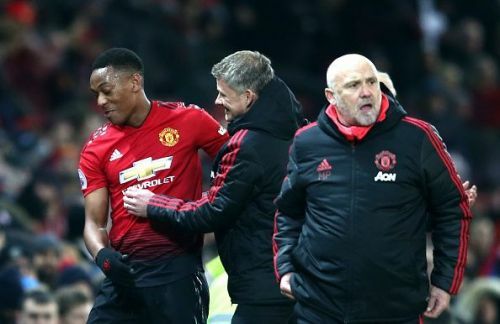 It seems like that Martial missed six matches in twenty-five days period due to his groin injury that hit him on the 13th of February, missing as much as Matic with Chelsea's game as well. Martial's comeback is expected to be a good one, he was doing his best for the team before this injury hit him 25 days ago, his form increased to a very noticeable level along with Marcus Rashford and Jesse Lingard as well. Manchester's injury list is still stacked with Eric Bailly, Phil Jones, Juan Mata, Alexis Sanchez, and finally Jesse Lingard. Their upcoming fixtures include Wolverhampton Wanderers in the Premier League and the FA Cup, Watford and West Ham United in the League, and of course Arsenal this Sunday. Manchester has shown a very tough defensive performance against Paris Saint-Germain in the Parc de Princes arena while missing almost eight of their default starting XI to knock out The Parisians out of the round of 16 for the third year in a row, making it to the quarterfinals of the Champions League.